Jon Whitley and Jay LaBouchardiere combine breath taking vocal harmonies and melodies, delivering original songs that are inspired and rooted in the landscape and history of the British Isles. 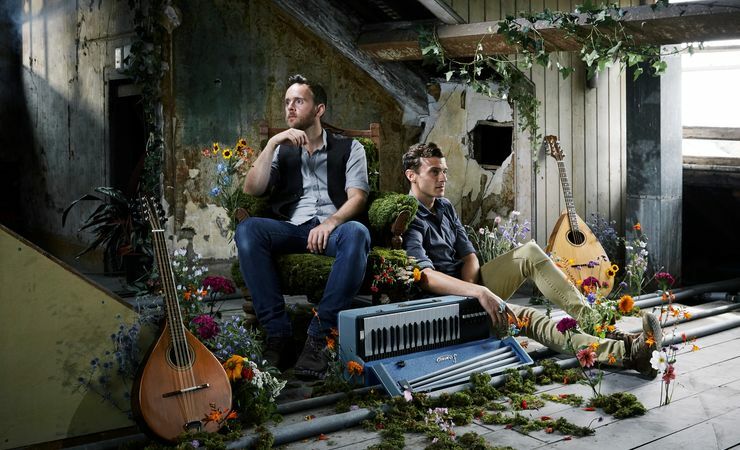 As well as crafting unique and engaging original material, Ninebarrow also take a wide-range of traditional folk songs and rework them in their own, distinctive way. Most recently, the duo were nominated in the 2017 BBC Radio 2 Folk Awards in the category for Best Emerging Artist. Their third album The Waters and the Wild highlights how their inspired song writing is ever evolving. Awarded 5-stars in both The Morning Star and the English Folk Dance & Song Society's EDS Magazine, the album has received airplay on BBC Radios 2, 3, 6 Music, Wales and Scotland. Folk luminary, Mike Harding, has hailed it as 'absolutely monumental' and in June 2018, the album reached Number 2 in Amazon's Folk best-seller chart. "A rather lovely thing. like two halves of one voice"